From inside Shibli Mohammad's dance studio comes the resonating sound of young girls clapping and reciting bols, or words used to define the rhythmic pattern in Indian classical music. In unison the Kathak students of the Nrityanchal school begin to dance with the accompanying tabla, the sound of their confident fast footwork, or tatkars, accentuated by the thick strand of ghungrus adorning their feet. Sitting in a corner of the room, Mohammad lazily plays a few notes on the harmonium, his sharp eyes watching the feet of the six girls in front of him. As the girls do a series of chakkars (turns) and finish practice, he murmurs his approval. Each of the girls come forward, take his blessings by touching his feet and slowly file out of the room. Mohammad is the co-director of Nrityanchal with dance partner Shamim Ara Nipa and coordinator Muhammad Jahangir. His dancing career started in Lucknow at the Bhatkande Music College in 1982, where he studied under Purnima Pande. Two years later, became the first Bangladeshi disciple of Pandit Birju Maharaj, the legendary Kathak dancer. Not wanting to restrict his training to just Indian classical he went to London in 1992 and studied Ballet, Tap, Jazz and Contemporary before coming back to Bangladesh and becoming a professional dancer and teacher. Despite all the experiences he has had in dancing he still finds Kathak to be the most in tune with his own emotions. Teachers of various dance schools are pleasantly surprised to see how dedicated their students are. 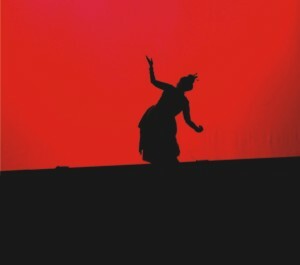 Sharmila Banerjee performing in the dance drama Chondalika. "In my opinion, Kathak is the most appropriate dance form for men," he says, "mostly because of the speed and style and also because of the flexibility of abhinaya [a concept in dance and drama which means the art of expression]. There is a boldness in the expression of Kathak which I do not think is as strong in other dance forms. Also it is a very interactive dance in which the audience is also very much involved. Lastly the dancer has the freedom to play around with the beat of the tabla, which makes it very enjoyable." But 'playing around with the beat of the tabla' is no easy feat. It takes years and years of training before one can actually even fathom experimenting with the footwork and manage to keep the rhythm of the dance itself. Both Mohammad and Nipa feel that many people take dance for granted and do not understand what kind of hard work goes into the training of a seasoned and experienced dancer. "I feel that the standard for what a good dancer is or should be in Bangladesh is very low," says Nipa, who began dancing from a very young age, later training with Nikunjo Biharipal in Kathak and folk. "And partially the media is to blame. They have no idea of what a good dancer is and often they only give publicity to those dancers who may not necessarily be good, but they have connections. The fact is that there is no real identity for dancers in our country but we are all trying in our own way to create some sense of awareness. It does not help, though, when we see these TV dance programmes. If you ask me, I really think that they have no idea what they are doing. Half the time they are copying a style of dress or a type of look without even knowing whether it goes with the music or understanding its significance." Minu Haque, convenor of the dance organisation, Nritya Dhara also feels that such TV programmes do not do any justice to the dance culture in Bangladesh. "What we see on TV is not the pure form of dance music in our country -- which encompasses both folk as well as classical," says Minu. "It is more of a ZTV type of dancing which has become popularised in Bangladesh because there is no scope for the real dancers. We are very advanced in terms of talent and training in Bangladesh, but there are no sponsors to provide us with the funding to move forward. "What makes matters worse is that the media does not give enough importance to real dancers. They are much more concerned with giving importance to actors and musicians and singers rather than dancers. Most dancers end up getting a raw deal and when they see that there is no real money in dancing, they end up moving towards other professions like modelling and acting because they realise that dancing will not be enough to get them by." Shamim Ara Nipa believes that it is extremely important to preserve the dance culture in Bangladesh. Minu has been dancing since she was five years old. She first trained with Dulal Talukder, now a dance professor in Harvard, in semi-classical and Manipuri, after which she spent two years in Bulbul Academy, where she got her certificate of dance in 1982. She then trained with Shanti Balasingha in Manipuri between 1988 and 1996. She finally studied Odissi with Sani Mahapatra and Ipshita Behura, who were students of Guru Kelucharan Mahapatra, a legendary Odissi dancer. It is from this last bit of training that she founded her school, Pallavi, the first Odissi school in Bangladesh, under the umbrella of her organisation Nritya Dhara, which also involves five other dancers from different schools such as Deepa Khondokar (specialising in creative and folk), Tamanna Rahman (specialising in Manipuri), Anisul Islam (specialising in Bharatnatyam), Kabirul Islam (specialising in creative and folk) and Munmun Ahmed (specialising in Kathak). Running the Rewaaz Performing School for several years now, Munmun Ahmed teaches students as young as three years of age. "That is the age when children are able to grasp everything around them," she explains. "In fact, I prefer to take in students as young as two or three because it's extremely rewarding as well." Munmun herself began training from a very young age, when she took Kathak lessons from Syed Abul Kalam in 1978. After completing her high school exams in 1987 she went to India and studied at the Ram Bharatia Kala Kendra under Ram Mohan Maharaj and Raj Kumar Sharma. Finally, in Delhi Kathak Kendra, she became a student of Pandit Birju Maharaj in 1989. She believes that dance performances are being accepted much more now than before, especially because more parents and guardians are readily sending their children to dance schools. "Unfortunately, there are still parents who expect their children to become celebrities as soon as they join my school, or any other dance school for that matter," she says. Despite the pressure that so many dance students face, most teachers find that there is a lot of enthusiasm among the public regarding this art form. Minu Haque, for example, says that the people in the middle class bracket are more prone to feeling a love for art and an appreciation for aesthetics, as opposed to the upper class, who, although they can afford to spend money in order to patronise this art form, often consider dance to be a cultural taboo. Lubna Marium surmises that although the subcontinent is home to some of the most exceptional dance forms in the world, for centuries, stage performances have often been frowned upon in society. 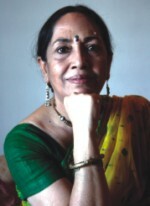 After her earlier training in an avante-garde style of dancing at the Bulbul Lalit Kala Academy of Dhaka in the late 60's, Marium studied Bharatnatyam and Manipuri, later specialising in what is known as Rabindranritya, a fusion style of dance incorporating different styles of dance to be accompanied by Rabindranath Tagore's music. 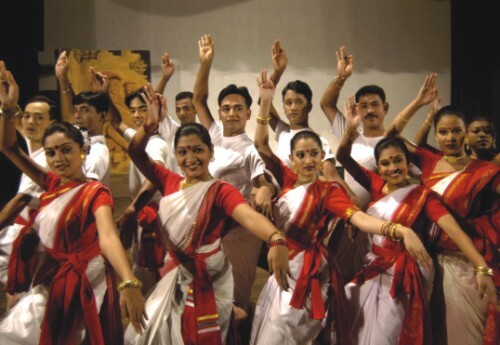 Tagore's influence on the dance culture in Bengal is very strong. Before his time, community dance performances were not very popular in East Bengal, like the Dandia in Gujarat or Odissi in Orissa and Bengal was always very conservative in terms of dance performances. However Tagore fell in love with Manipuri when he had gone to visit Sylhet. Almost immediately, he invited a Manipuri expert from Sylhet and a Mohiniatyam expert from Kerala to Shantiniketan. Although he was never a dancer himself, he played a huge role in experimenting and fusing with the dance forms, which ultimately came to be known as Rabindranritya. It was Amita Sen, Amartya Sen's mother who brought Rabindranritya to East Bengal after she got married. Munmun Ahmed's expertise in Kathak comes from her earlier training with the legendary Pandit Birju Maharaj. Whether or not dance culture suffered as a result of partition, it is a fact that the dance industry in Bangladesh has a long way to go in terms of not only the stereotypes attached to dancers, but also the striking lack of patronage towards this particular art form. The attitude towards dancing, according to Amanul Haque, convenor of the Nritya Shilpi Sangstha, the national organisation that works alongside with other dance organisations on the development of the dance industry in Bangladesh, creates many obstacles that serve in stunting the growth of dance in Bangladesh. "We cannot claim to even have an industry," says Haque, "because we have such poor or little patronage of dance. I still don't understand why, when there are so many art forms that are blossoming as a result of strong financial backing. I suppose it may have something to do with the fact that people consider dancing -- for both men and women -- as a social taboo. We are trying to fight this, by reaching out to schools and colleges, and implementing dance into their curriculum. Most of these students are very passionate about dancing and it is really sad for them because they do not have enough sponsorship to go too far." Minu Haque's dance troupe, Nritya Dhara. Despite all the obstacles that the dance industry in Bangladesh faces, Lubna Marium believes that the establishment of the Nritya Shilpi Shangstha has been a major step in developing the state of dance in Bangladesh. "We have very standard forms of dances in Bangladesh today," she says. "There is more research involved now and boys and girls are actually interested in studying dance as well." Because of the avid interest shown by students, Shibli Mohammad and Shamim Ara Nipa feel that those who have a bright future in dance may not be able to consider it as a profession due to lack of funding. According to them there is a great deal of interest from many of their students and their parents to preserve the dance culture in Bangladesh. "Most of these kids love dancing," says Mohammad. "And what makes me hopeful about the future of dance in Bangladesh is that those of us who run schools see how much trouble these kids take to actually come and learn. They take it seriously. Some of them come from all over Bangladesh and stay in small hotel rooms or stay at someone's house for a month just so they can have the experience of training with us. These kids train from morning to night, without eating or sleeping properly. They are so dedicated and it is very important for these children to be promoted, especially those who don't have other options." Nipa adds on to this by admitting that many of the selection boards are not fair to the students who deserve it. "Sometimes I find that there is too much emphasis on who knows who rather than who really is a good dancer. I was a small town kid who came out of nowhere and just because I was a good dancer I was selected to go on a government tour by Shilpakala Academy. That does not happen very often these days. The selection boards have become increasingly corrupt and often do not play fair." Like Mohammad and Nipa, Sharmila Banerjee, a dance teacher of Chhayanaut and founder of the dance school Nritya Nandan, believes that the enthusiasm of the general public towards the dance culture in Bangladesh is an indication of how bright the future of this art form is. 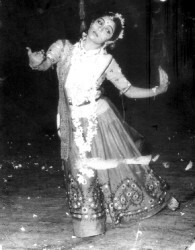 Sharmila, who got her degree in dance from the Visva Bharati University in Santiniketan, studied Kathak under the tutelage of Guru Shankar Narayan and Manipuri under Jiten Singh, later on completing her graduate studies in Manipuri at the Manipuri Nartanalaya Kolkata under Guru Bipin Singh and Srimati Kalavati Devi, as well as studying with Shanti Balasingha. In addition she studied Bharatnatyam under Shankar Narayan and Thakamoni Kutti and Odissi under Sani Mahapatra and Ishira Behura. "Socially, dancing on stage is becoming more and more accepted all over the country," she says. "Compared to years ago, a lot more children are becoming increasingly involved with classical dances. The social perception, however, still needs to change. Dance is so much more than colourful costumes and trying to look good on stage. It is a way of life and expression in itself. It obviously requires a lot of hard work and passion." This passion and dedication felt by all the dancers comes out in the way they work together in order to keep this art form alive. Every year in the month of April, the dance community in Bangladesh gets together for a three-day festival catered towards promoting and preserving the country's dance culture. This year, between April 27th and 29th Nritya Shilpi Sangstha and the Shilpakala Academy are jointly organising a huge festival to celebrate this art form, which is forever struggling to stay alive in a country where it remains neglected at the administrative level. Despite the enthusiasm of the dancers themselves, their families and their audience, the general stigma attached to the art form cannot be denied and often, despite the fact that it takes a great deal of training and hard work, the dance community finds itself out in the cold in terms of patronage and financial support. The Mahua workshop organised by Nrityanchal. Passion for anything, however, is hard to reign in and the dancers of Bangladesh are showing for the last few decades that they will not be intimidated by apathy or disdain. They continue to dance their hearts out amid disapproval, lack of proper funding or platforms to showcase their work. It is this unbridled love and perseverance that will hopefully keep the dance community going for years to come.